Google currently has 13 data centers located in North America, South America, Asia and Europe. 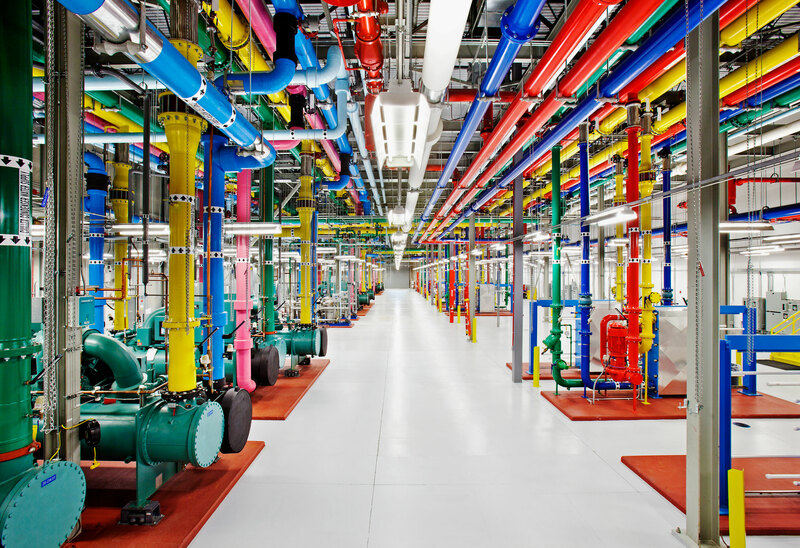 These data centers house the thousands of machines needed to run Google’s operations. Whether a customer is using Google to send an email, make an online transaction, search the internet or do business with Google Apps, all the information is processed through a Google data center. Employees at the data centers work hard to keep Google running smoothly. In addition, they work to assure that customers’ information is kept safe and secure. The following details the facets of keeping Google’s data centers working and constantly improving. Google is the first of the main internet services companies to be given certification due to the high environmental standards employed in their US data centers. They are dedicated to being green through the wise use of energy. Google is working hard to conserve and reduce energy in all of their data centers. Most data centers spend 80 to 90 percent more energy in cooling their machines than in running them; Google’s cooling costs are only 12 percent higher than machine operating costs. Only 50 percent as much energy is used at Google data centers as is used at other data centers. Thus far, Google has over a billion dollars in energy costs. At Google data centers throughout the world, a wide variety of methods are being used to keep energy costs down while protecting the environment. Google buys electricity from wind farms near their data centers. Additionally, 33 percent of the energy they use is renewable energy. They also have solar panels on the roofs of their data centers. In an effort to improve the environment by reducing the number of vehicles on the road, Google has created a bike to work program. They also have a shuttle program to transport employees to and from work. Inside Google’s data centers, the temperature is raised to 80 degrees Fahrenheit. Outside air is then used for cooling, thus further reducing energy costs. Google’s servers are specifically designed to use as little power as possible. Removing all unnecessary parts and minimizing power loss makes the servers more green. Not only is Google continually looking for ways to reduce energy and improve the environment, they are also helping others to make an impact on the planet. Email hosted on local servers can leave a carbon footprint more than 80 times that left by a Gmail user. Companies that use Gmail decrease their environmental impact up to 98 percent. Through Google’s desire to produce renewable energy via solar panels and wind farms, they are actually able to produce more energy than they need. Over 500,000 homes could be powered with the excess energy Google produces. Reusing and recycling are an important part of Google’s business. When machines become outdated, they are repurposed and continue to be used in Google’s data centers. After a machine is no longer usable, all data is completely erased and parts are either reused or sold. By repurposing machines, Google has been able to eliminate the need of purchasing over 300,000 new servers. When it comes to security, Google does not take any chances; they are committed to protecting the proprietary information of their customers. From physically securing data centers to meticulously building and monitoring servers, employees are working hard to keep customer and company information safe. As technology continues to evolve, Google persists in their efforts of improving security measures to ensure the ongoing safety of its customers’ information. 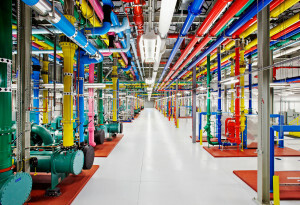 Google builds their own custom servers at each of the data centers. The servers automatically back up data, which protects customers in the event of their own system failure. These servers do not leave the data centers until they are non-functional. Then the data is completely erased and they are broken down and sold as parts. In addition, when hard drives become unusable, the data on them is deleted in a thorough process. Then they are either crushed or shredded and then sent to a recycling facility. To prevent hacking, Google stores each customer’s information in chunks across many data centers. These information chunks are unreadable to humans and are named randomly. As malware is a legitimate threat, Google makes every effort to prevent and eliminate it. However, if a security incident were to occur, Google’s security team makes it their priority to resolve the issue as soon as possible. There are specific plans in place in the event of a disaster of any kind. If there were a disaster, including a natural disaster, fire or security breach, data would automatically be transferred to a server at another data center. If a power failure occurs at any of the data centers, there are backup generators to keep everything running. To avoid potential power outages, Google has an air cooling system to keep machines at a constant temperature, which keeps them from overheating. Each data center employs a security team around the clock. This security team is dedicated to maintaining a security at each data center. Security guards, surveillance cameras and fencing help to keep the facility secure. Improved technology including thermal imaging cameras help the security team members look for suspicious activity on the premises. Some data centers use biometric devices to further ensure a safe and secure facility. Only authorized personnel are allowed on the data center grounds. No public tours are permitted, and security guards at guard stations allow only authorized employees past security checkpoints. In order to keep the inside of the facility safe, video monitoring of all areas allows the security team to view all areas of the data center. All employees must undergo an extensive background and reference check. They are trained in procedures of security and ethics. Google limits employee access based on their position. This is just another way Google is working to keep its customers’ data secure. Google’s data centers contain vital customer information, and Google is dedicated to securing and protecting the information. Through custom machine production to detailed security procedures, Google ensures data centers are running effectively and efficiently. Using renewable energy allows them not only to save money, but also to improve the environment.